So, we're kind of in the middle of about five different projects right now. We're still plugging away at the trim for our downstairs; I really, really want to have our two living rooms painted before Thanksgiving (which I've started - yay! ); Josh is drywall jointing our master suite walls so I can paint them and install our closet storage; then we have to put in the floors. I also am about to start painting the other side of our living room fireplace so it can match the side we've already done in time for the holidays (I have big plans to make it a holiday wrapping station for Christmas). So, today, I'm talking bedroom goals. Bedding: Nadine quilt from Pottery Barn (no longer available); Floors; Deer artwork by PaperMeadows; Bed: Channing by Pottery Barn (no longer available); Benjamin Moore Bunny Gray; Storage Photo courtesy of Ana Rosa; Grayson Pendant by Birch Lane; Ceiling photo courtesy of My Ideal Home. I've had a pretty clear vision on how I wanted our bedroom to look since we started to vacation in Vermont (our first getaway together), and thankfully, Josh agrees with my vision. Over our years together, we've taken more country escapes than tropical vacations because, clearly, we like to be out in the middle of nowhere surrounded by peace and quiet. 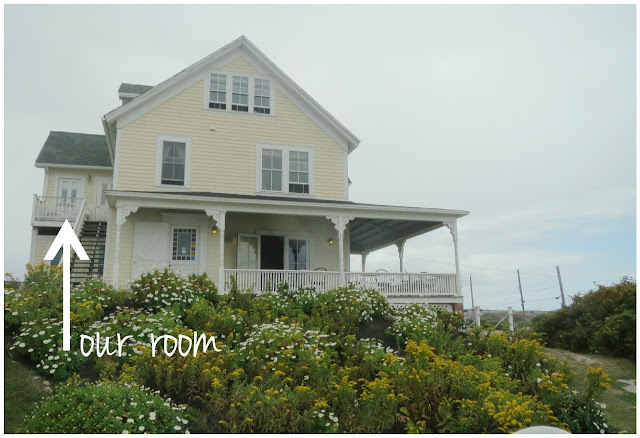 We've always stayed in really lovely B&B's and Inns that have the most cozy, warm and inviting feel to them, and since our very first long weekend in Vermont that we took together about 10 years ago, I've known that's how I wanted to design our room once we had a house. A month or two before our one year wedding anniversary, I casually mentioned to my mom that I found this amazing patchwork quilt at Pottery Barn that I loved. 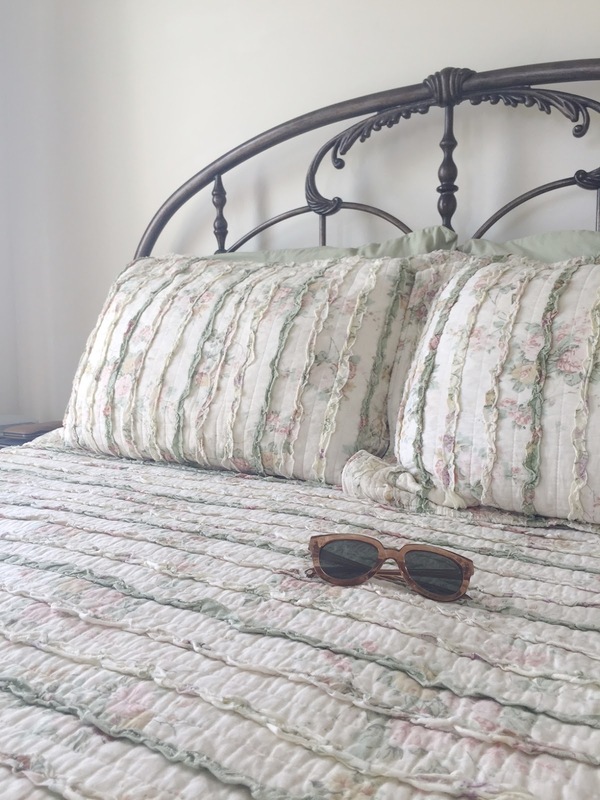 It had all the colors and patterns that I'm drawn to, and it worked with so many different other colors and hues that I knew it was the perfect long-haul bedding. I was so surprised to come home to it one day, waiting for us on our Chicago doorstep, as a first wedding anniversary gift from my mom. You can't buy the quilt anymore, but she's called Nadine, and she's beautiful. 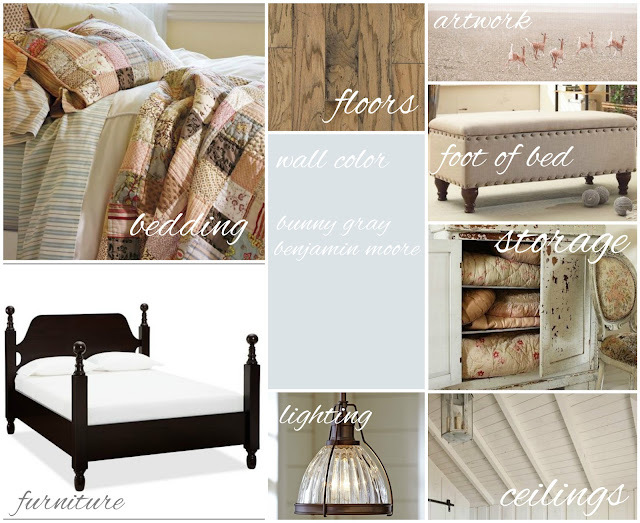 Our bed, also from Pottery Barn, is classic and traditional, with a little bit of cottage flair. It's the Channing, which they no longer make, so I'm so glad we decided to buy it when we did because even now, we're both so in love with it. Because there's some light blue-gray woven through some of the patterns in the quilt, I decided I wanted to use that as our wall color. Finding the right color, however, has taken months, and I'm rather embarrassed to say that. Blue-grays might be the hardest colors I've ever had to pick out because in certain lighting, most of them end up looking powder blue, which we both wanted to stay away from. We got a few different samples and painted swatches of them all over our master suite, since it's the color we wanted to use in our bedroom hallway, closet and actual bedroom. We're both pretty sure we're set on Bunny Gray, but I'll probably change my mind tomorrow. We've also purchased our bedroom flooring, and we decided to go with Manufactured Engineered Hardwoods for a variety of reasons. 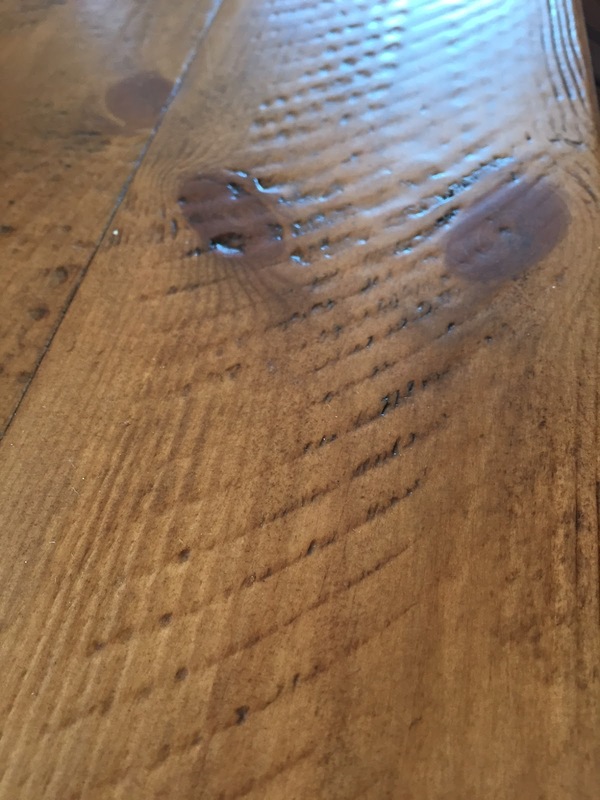 We chose a really pretty distressed-looking oak, which I think will be a nice contrast to the dark furniture we have, and pair beautifully with the light gray-blue walls. It's no secret that Josh and I love animals, and we've been having fun picking out photographs of animals to hang in our bedroom. Etsy has been a great source for deer and woodland creature photos, which may sound really weird and stupid, but we're kind of all about it. It's the highlight of our day when we see the little deer family wandering around our yard. I'm still rather smitten with the leaf switch plates we put in our downstairs entryway, and so we plan to continue them into our bedroom, and have most fixtures in an antique bronze. I've already picked out our lighting fixtures and I'm way too exited about them. Finally, because of the classic barn shape our ceilings have, I got it in my head as soon as I saw the space that we must do wood planks on our ceilings in a white wash/white paint. I say ceilings because the current plan is to plank the ceilings in our hallway, closet and bedroom to tie it all together. We were hoping to be done with the walls and floors before Christmas so we could finally move into our bedroom (we're currently sleeping in one of the guest rooms), but, it's likely not going to work out that way. Sad face. But, it'll be worth the wait - I hope anyway! 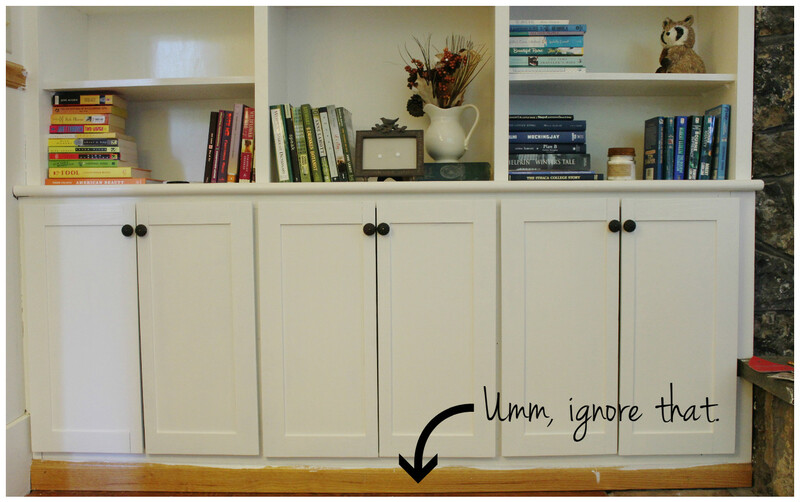 Once we painted our kitchen a light, light gray (Benjamin Moore White Wisp), I was stuck on the doorway trim. I was leaning toward painting it white to match the cabinets and shelving we have, but something kept telling me to hold off because there may be a better option. I spent the next few weeks fighting the urge to pick up a brush and paint over the existing trim. One night while sitting on the couch with Josh, though, I literally sprang up and went off on a tangent about an idea I got. 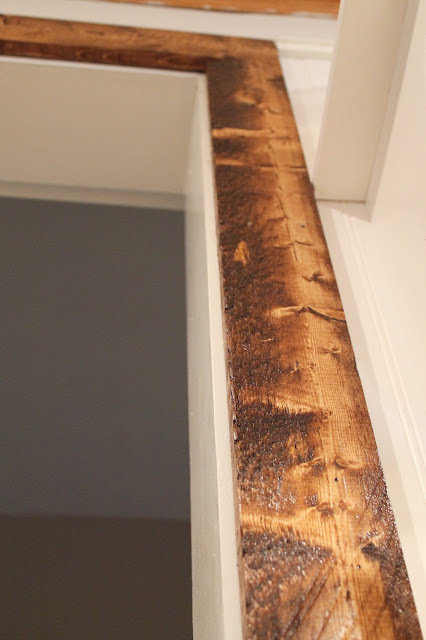 "Ohmigod what if we make our own 'reclaimed' wood doorway trim and buy planks at Home Depot and beat it up and stain it a color that ties into the dining room and OHMIGOD seriously it'll look amazing with the gray walls and will go so well with our rustic-y dining room and seriously, we need to do this." 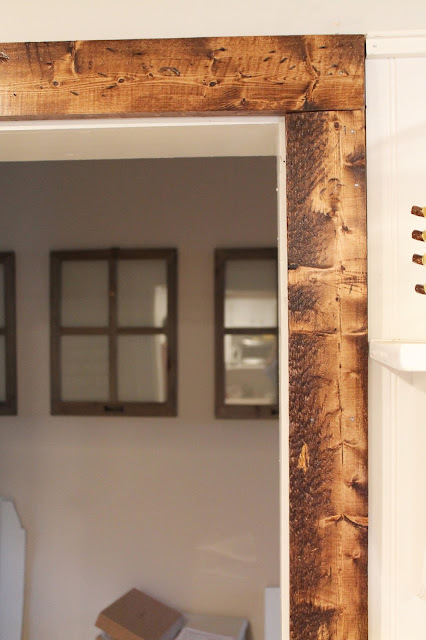 It took about a month after that to start the project, but I'm so excited to report that we've put up our tester trim around one doorway, and I'm like, so thrilled with the outcome. Since finishing the cabinets in our kitchen, I've been looking for ways to tie the dining room into the kitchen. Our dining room table is very warm and rustic-y, and the room will be painted a really pretty warm peachy color once we get to it. Our kitchen, though, is bright white and light gray, which tends to look a bit more modern at times. But, the two rooms flow right into each other, and I wanted one element in both spaces that brought them together. I really think the doorway trim does that. 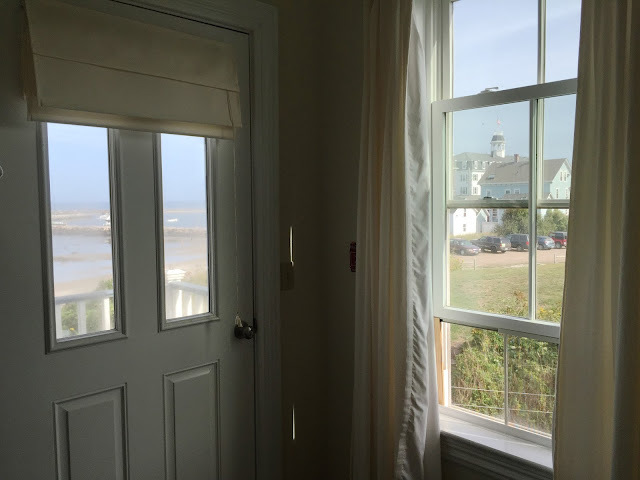 We plan to put this kind of trim around all the doorways in the kitchen and mudroom, around our kitchen window, and around the main entrance that connects the kitchen and dining room. Sooooo, it's a project. But, the great thing is, we can do one doorway at a time, and one only takes a weekend-ish to do. 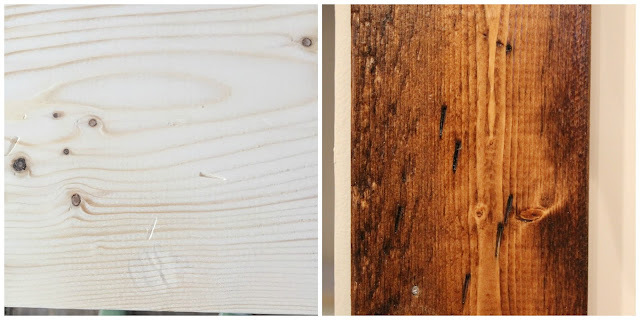 Rather than investing what would end up being at least $1,000 for reclaimed wood for all the doors, we went to HD and bought basic planks in the sizes we needed, and did our best to make them look old. 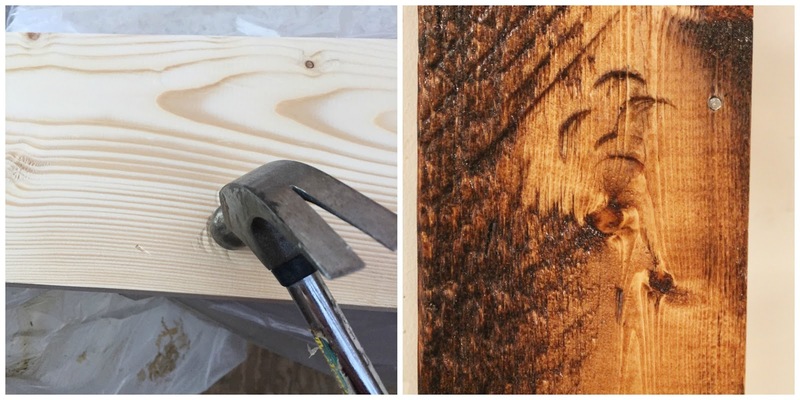 To do this, I looked at photos of reclaimed wood online to see what characteristics made them stand out, and also, read a few techniques on distressing wood on different house blogs. In the end, here's what I did to our planks to make them look older than they were. First, we picked out wood that had the most imperfections. We looked through the entire stock and selected the ones that had a lot of knots, texture and inclusions.That alone did a lot of the work for us. Then, THEN, I got to relieve a lot of stress. I started by lightly sanding all the corners of the wood. 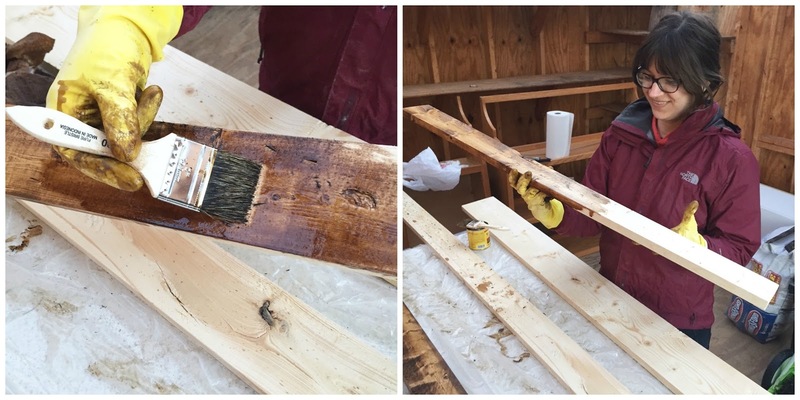 New wood has sharp edges, and old wood does not. So I needed to fix that. To start distressing the wood, one of my favorite things was just taking a hammer to one concentrated area of the plank to make it look like it had been, well, hammered a lot over the years - like it belonged in an old barn or something. It was hard to see what kind of difference it made when the wood was in its natural state, but once it was stained, I LOVED the way it came out. My second favorite thing I did was something I tried to copy from our dining room table. 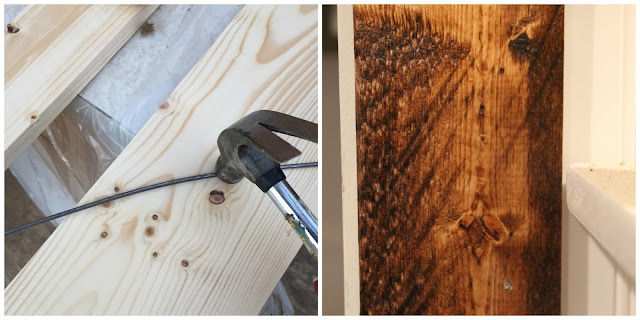 Our table has saw marks on it (or, what I think are saw marks, I could totally be lying to you right now), and I decided to try to recreate them on our planks by hammering a thin piece of sturdy metal in clusters. Not all of them came out exactly as I had wanted, but for the most part, it worked, and I was rather proud of myself for figuring out a way to do that. Lastly, I just plain old beat up the wood. I took the back of a hammer and made some light jabs at it. I also threw screws at it, dragged screws across the wood with my hands, and used the pressure of a hammer to roll screws on the wood. Rolling screws over the wood with the pressure of a hammer. For the stain, I deliberated on this a lot, actually. I bought like six samples of Minwax stains, and after quite a few tester boards, I chose to go with Early American. It had come down to this one and Provincial (which is what we ended up using on our mantel), but I liked how EA was warm, and also went pretty dark over knots in the wood, so it had a lot of dimension to it. And I wanted warmth, but not so much so that it was reminiscent of all the oak that was in the kitchen before we changed everything. I had every intention of even mixing stains to get the perfect color, but EA was perfect already, so thankfully, that part was pretty easy. The planks needed two coats of stain, and two coats of poly. When they were done, it was so amazing to see them exactly as I pictured them in my head. Once they were actually up, I'm pretty sure I jumped up and down. One doorway down, six more to go! We had a bit of a cold spell here in Upstate New York this weekend. And by cold spell, I mean winter came about a month and a half early. We even had snow today! And while I've been in a fall mood since the first of the month, I was all about autumn everything this weekend with it being especially chilly. Here are a few of my favorite fall things as of late. 1. 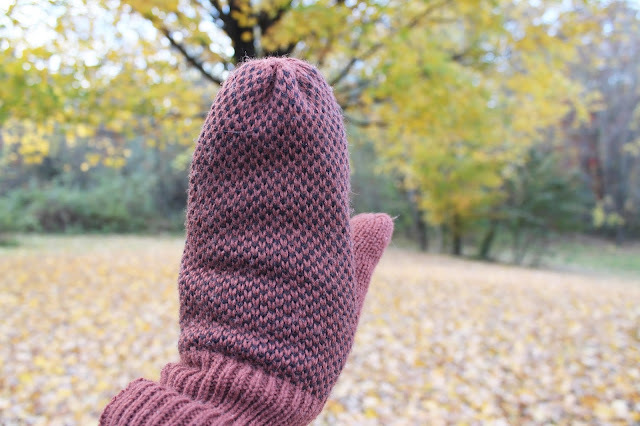 These mittens from H&M are an amazing rust color that pairs perfectly with fall colors, and they have the softest fleece lining inside that's been keeping my fingers nice and toasty on our fall hikes. 2. Speaking of being nice and toasty, for part of the weekend, we were trying to hold off on turning our heat on. We always try to make it until the last week of October (spoiler alert, we didn't). The day before we turned our heat on, I stepped into these bad boys. 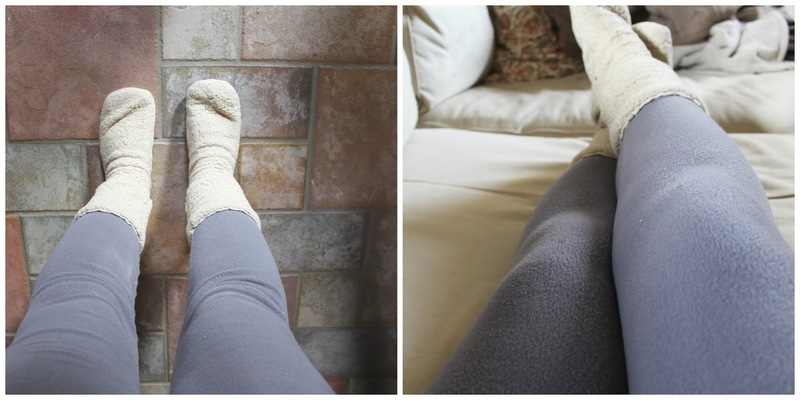 These fleece leggings from Target are uh-mazing. 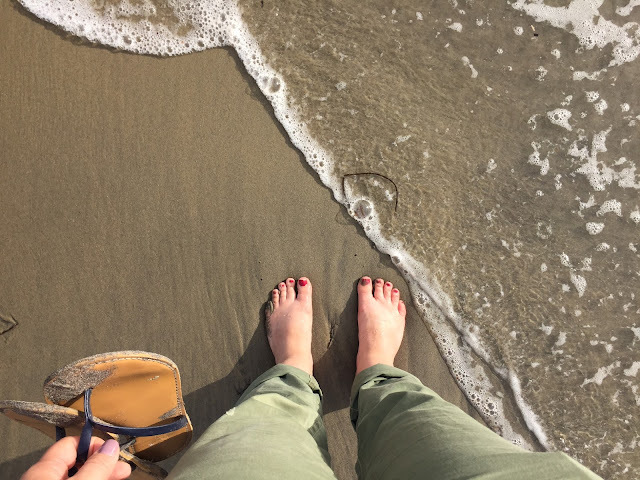 A few minutes after putting them on, the bottom half of my body was so much warmer than my top half. Plus, they're SO soft. Like, really, really soft. I plan to buy a few pairs of the leggings and the matching tops over the course of the next few months to get me through winter. Also, these slipper socks are some of my favorites. They're by the brand Lemon, and you can find different styles by them at DSW. I look forward to getting a new pair every fall because they're so warm and they look cute. Although a little pricey, they're worth the splurge. 3. My skin is already starting to dry out because of the cold air outside, and I've also been experiencing some breakouts recently, so my skin has been all over the place. When that happens, and my usual skincare regimen doesn't keep it under control, I start smothering honey all over my face for about 20 minutes after cleansing. 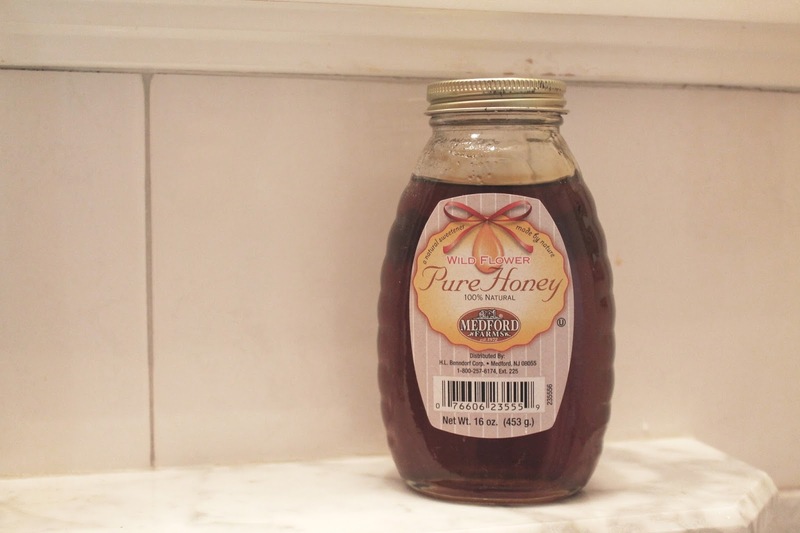 Just honey, nothing else. And after a day or two, my skins feels hydrated, smoother and my acne starts to disappear because of its antibacterial nature. It's truly amazing. And all-natural. And you probably already have it in your pantry. And it tastes good if you "accidentally" lick it off your face. 4. One of the reasons I've been getting acne: It's Halloween Candy Season (HCS)! There's something about sitting on the couch with the lights dimmed, cuddling under a warm blanket, lighting a candle and diving into a big bowl of fun-size candy bars while watching a scary movie, amiright? 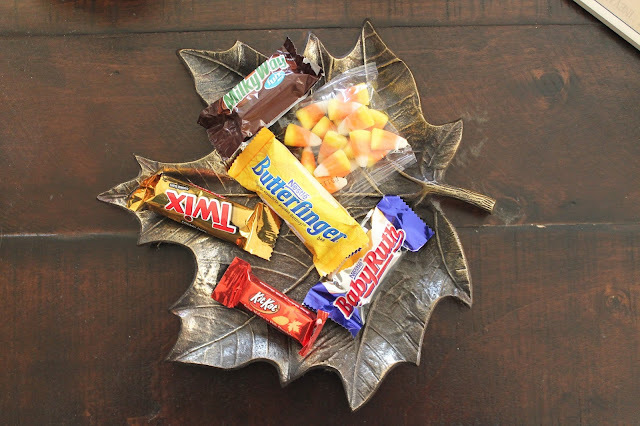 I'm not a candy bar person the rest of the year, but I'm all over it in October. But they have to be fun-sized. Or I'm not interested. 5. 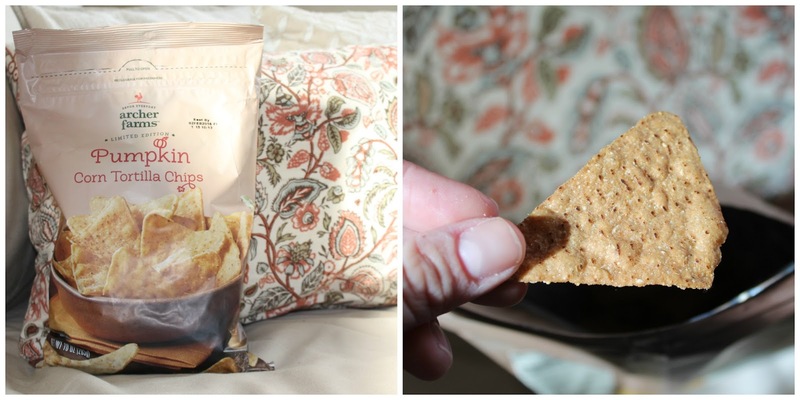 These pumpkin tortilla chips from Target are like, so good. Trader Joe's also has something similar, but to my surprise (because I'm obsessed with everything TJs), I prefer these. You should stock up, though, because you'll probably eat your first bag in one sitting. I found mine on an end cap near the chip aisle. 6. This entire weekend, I had soup for dinner. I crave it during cold weather. My favorite is the Trader Joe's Minestrone (pictured) and the TJ's Pumpkin soup. We also found these cheddar beer cracker things at Fresh Market, and they were pretty awesome. 7. When I was younger, and even now, I loved the Anne of Green Gables series. L.M. Montgomery's writing is so very quotable, but for the month of October, this is clearly perfection. 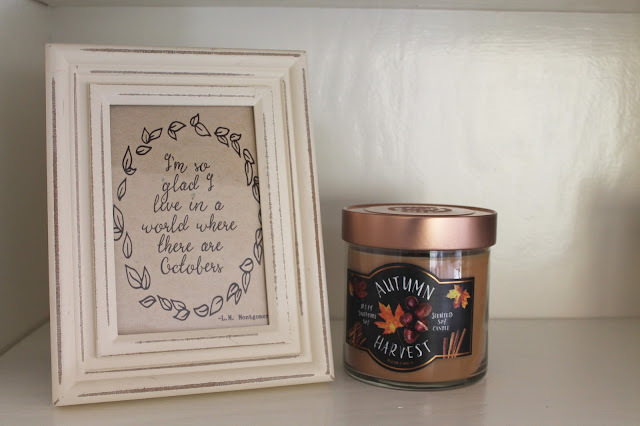 I had to frame it and put it in our bookcase as a reminder to take in every day of October, because it goes by so quickly. The print is from Etsy and the candle, which is also lovely, is from Target. 8. 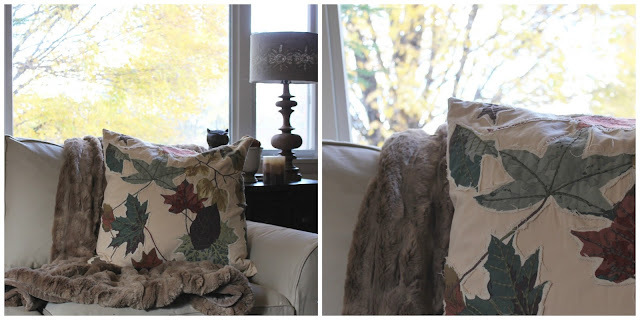 Cozy-ing up our sofa with autumn pillows and faux fur. 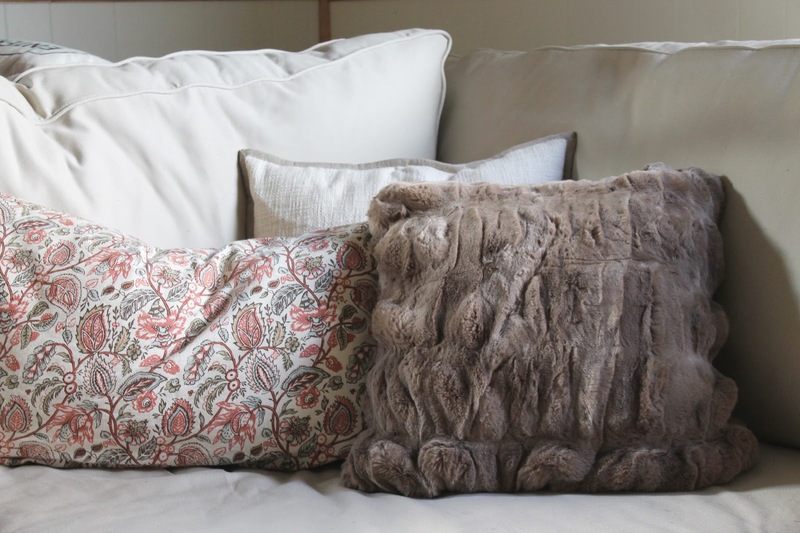 I never thought I'd be a faux fur person, but this season Pottery Barn came out with a pillow and matching throw that I was obsessed with. The pillow cover I bought myself* and the throw was a gift from my mom. They've been so amazing to cuddle with on the couch on a chilly afternoon, and it's so nice to think of my mom when I use the throw. It only has one problem: I can't get off the couch when I use it. *I work for the Williams-Sonoma brand and received an employee discount on this item. 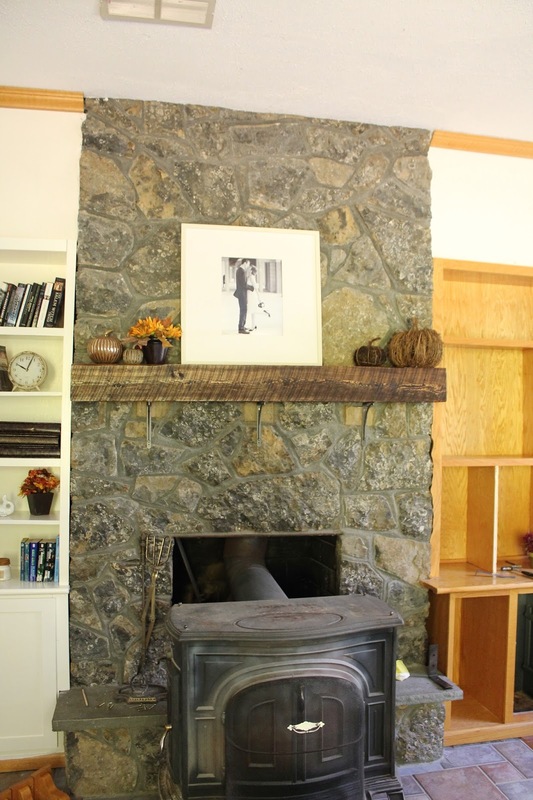 Most importantly, a very special thank you to my friend Maggie of StoryStyleVision for giving us the beam to finally update the fireplace in our living room. Not only was this amazingly generous and kind of her, but it's extra awesome because now we think of her when we look at it. Thank you, Maggie! 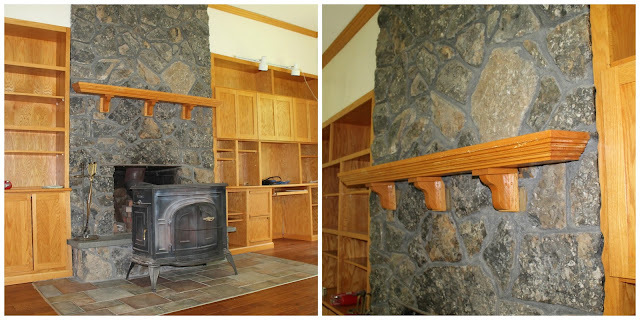 As with most everything in this house, I had a pretty clear vision of the fireplace mantel, which did not include the existing wood piece, and instead, included a chunky wood beam. But, beams like that are actually hard to find and pretty expensive. Well, let me re-phrase. 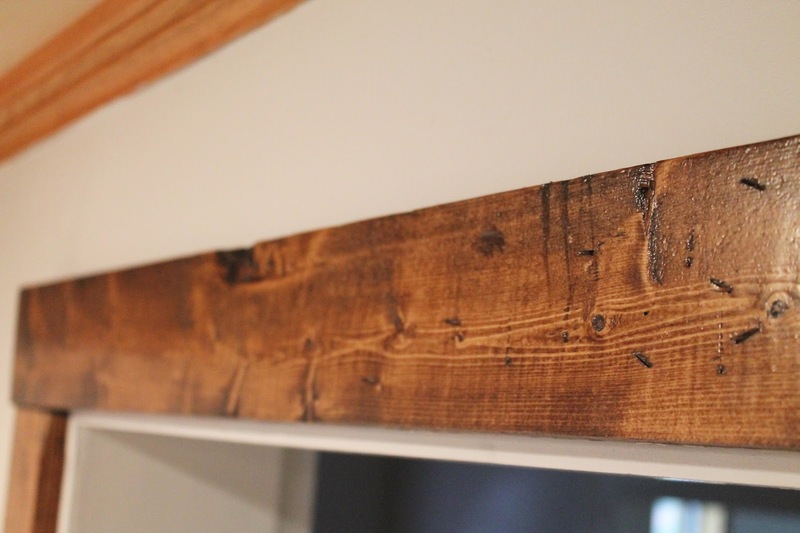 These are hard to find and expensive if you decide you want an actual reclaimed wood beam with a story and history. This is what I originally wanted. I thought to myself, Well, this house is old, and it seems fitting to put something from its time up on the fireplace. Plus, I'd be recycling, and it shouldn't be hard to find an old beam somewhere so it's a win-win. This did not happen as planned. When I started researching reclaimed wood beams, I saw how ridiculously expensive they are. Like, hundreds of dollars. I get it, and I don't at the same time. I understand that you pay for the character and the story attached to the wood. I can definitely see value in that. But for the size we'd need, we were looking at $300 or so, maybe more, for a reclaimed wood beam. It was out of my comfort zone. And also, a little bit of a shock. My original plan was go to to Home Depot and just buy a 6 in. deep beam in the lumber department. But when my friend Maggie told me to reach out to her before doing anything, I decided to do that, and she stepped in to save the day. Her and her husband were even kind enough to cut it down to the right size so it fit into our tiny Honda Fit for easy transport to its new home. I don't have any photos of the staining process because, well, staining is messy, and I don't have a camera crew that follows me around while I do these things. But, I do have befores and afters. I contemplated leaving the wood in its total natural state (no sanding or priming or staining or anything). Then I thought better of myself and gave it a decent sanding - not too much though, just enough to smooth it down a little and round off the edges), and decided to stain it Minwax Provincial. One thing I didn't know before I started this project, though, was that pine soaks up a lot more stain than other woods. So it came out to be about three shades darker than my tester board (which was NOT pine, stupid me), but it worked out in the end because I actually prefer it this darker color. We also applied two coats of poly to seal it in, and protect the wood. The main complication we had with this project was mounting it. I had in my head since the beginning that I wanted to use thick, industrial corner brackets, and spray paint them bronze. We couldn't find any in the size that we needed that were sturdy enough to hold up the beam, though. So I had to let go of the idea. Our next thought was to make it a floating beam, but after looking into it, we were concerned about puncturing the stove flute if we drilled too far into the stone, so that was immediately crossed off as an option. 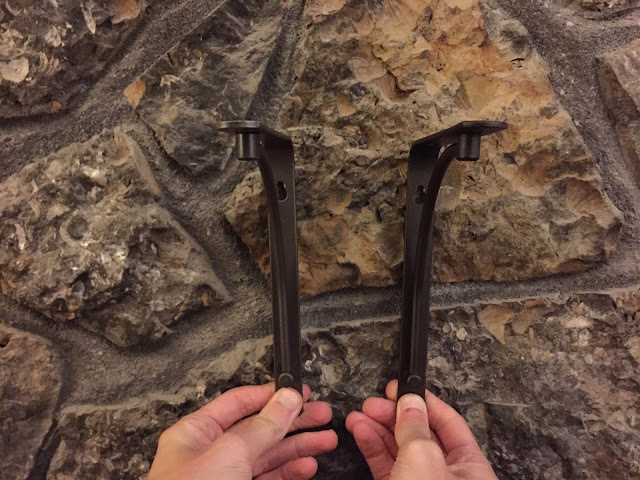 Finally, we just decided to go back to brackets, and find the best ones in the size we needed. Finding 6 in. deep brackets was actually harder than I thought (most come in 8 in. ), but we ended up finding the ones we used at Home Depot, and we spray painted them bronze. At first, I hated these when we got them home and put them up against the stone. The black was a harsh contrast, and I thought it made the whole project look dated for some reason. While I'm not in head-over-heels in love with the brackets now, the bronze spray paint made them a whole lot better. Bronze on left, black on right. I'm fully aware of how minimal the difference in color is, but I'm crazy, so they needed to be bronze. The bronze just blended in with the stone more, and I dunno ... it just worked in a "you'll have to do" kind of way. The previous owners had installed their mantel into wood blocks, which unfortunately, are still visible under our beam. That, we don't know what to do with. We'll probably try to paint those a similar color as the stone to blend in. Overall, though, it was so nice to get this sucker up, and to take down the existing one, especially going into the holidays when the fireplace is such a huge focus for decorating. I can't wait to decorate it during Christmas. Can I do it now? No? Okay. This may sound crazy to some people, but our kitchen almost had too many cabinets. So much so that it closed up the space more than it needed to. The minute we walked in, I knew immediately that I wanted to take down at least two to really open the space back up, and we ended up taking out three. I'm going to focus on one today because the other isn't done yet. The wall that we started with had a top and a bottom cabinet, and we decided to keep the bottom, and rip out the top. 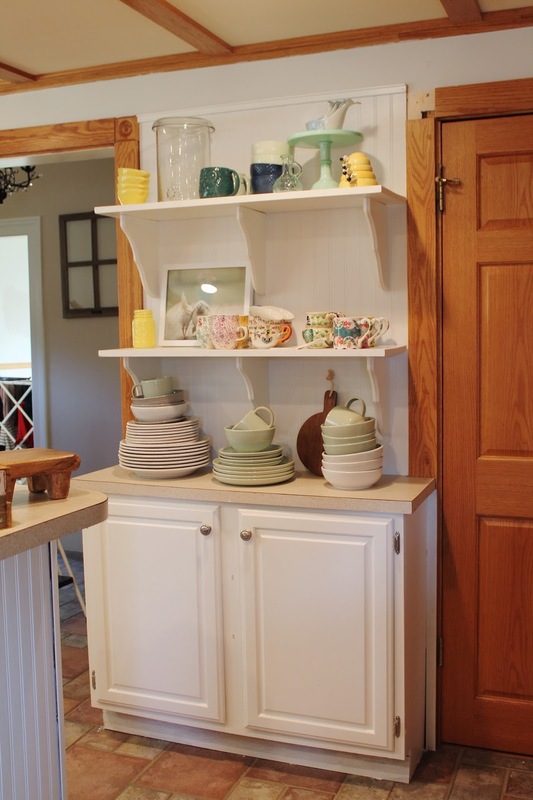 When you come in from our mudroom, it's the first wall that you can see, and when walking by it, the upper cabinet really ate up a lot of space, and also made the walkway feel a little tight. The second we ripped it out, it already felt better. We were lucky enough to have help from my Aunt and Uncle that day, and everyone was like, "Look how much bigger it looks in here!" the second it came down. It made a much larger impact than I was expecting. I loved it because of the beadboard backdrop, which to me, made this little wall look so inviting and cozy. I had contemplated painting it a very, very light, almost white, mint color, and then decided to keep it white because most of our dishware and such is brightly colored as it is. Thankfully, my amazing Aunt and Uncle were willing to help us build the shelves during their visit, and we were off to Home Depot that same day to buy the wood and brackets. As soon as we got back, we were already painting them the same color as the cabinets (Simply White by Ben Moore) and they were hung within a few days. Soooooo, we still need patch the holes in the front of the bottom cabinet, and clearly the doorway and current trim are really clashing, and our trim is half off, half on, BUT, it's coming along. The only issue we ran into was where to cap off the beadboard at the top. Do you bring it flush with the ceiling? If you do that, you still need to add moulding to hide the seam. Or do you? Do you line it up with the doorways? Oddly, this decision took days. DAYS. We ended up keeping it flush with the doorways to keep symmetry (but, you'll see, the doorways aren't even, either, because the house is so old, so we'll have to play around with the moulding when we get to that). We bought a simple piece of moulding from Home Depot to cap off the beadboard and hide the seam, and I love the way it came out. 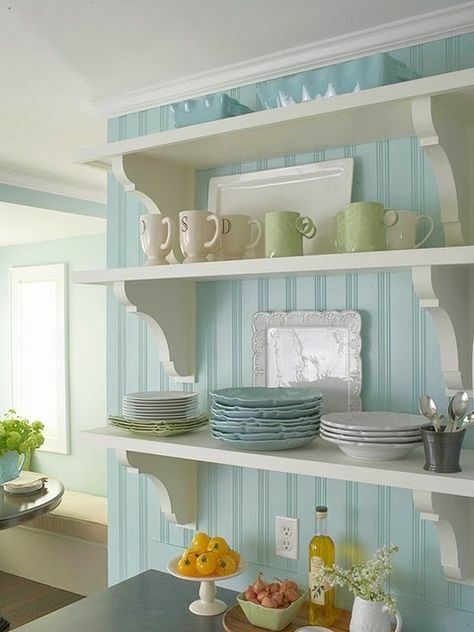 Because the other wall of open shelving isn't yet done, this one is a little - er - cluttery right now. BUT, it holds a lot of our almost-too-cute kitchen-y stuff that I like seeing every morning when I come into the kitchen, and it gives us easy access to our plates, mugs and bowls. I'm itching to get the other side done, but it's requiring re-tiling part of the floor, so it's taking longer than expected. But, the good news is that we were finally able to replace the mantel on our living room fireplace this weekend, and it looks SOOOOOO much better. Stay tuned. So I have a blog post planned that talks about things we've changed our mind on after living in the house for a few months. 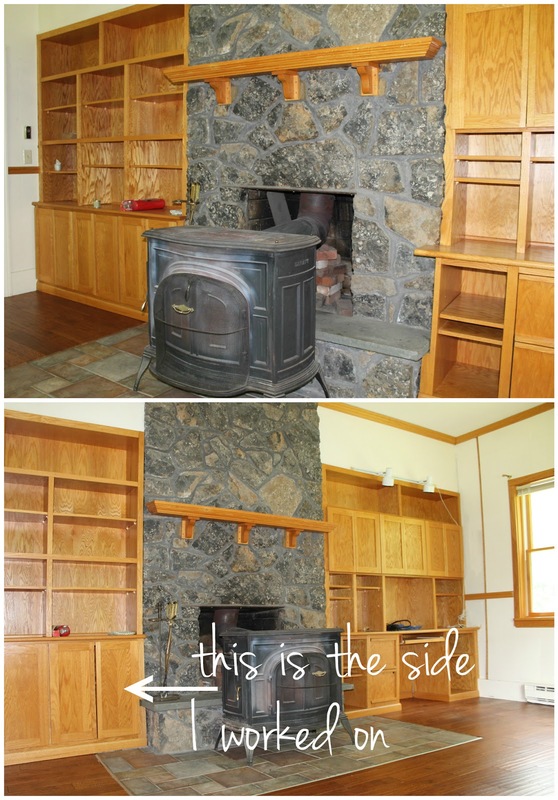 Our built-in bookcases in the living room were one of those things. 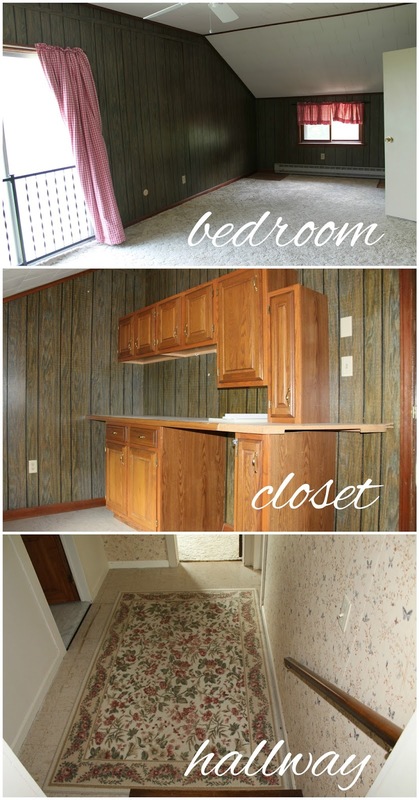 When we first saw the house, we both hated the built-ins because they weren't done very well. One side was okay, but the other was, and is, a nightmare. After getting a lot of opinions on what to do, I finally caved and decided to paint them the same color as the trim (which isn't painted yet, but it's happening). One day, I just woke up and decided this was my next project, and I just went for it. I had been itching to put out some knick-knacks and books to make the living room feel more homey, and I knew once I painted this one side of the bookcases, I could finally unpack some of those boxes and put our out our tchotchkes. I focused on this one side of the fireplace because the other is a weird/built-in, totally asymmetrical, desk situation that needs some more planning. I'll get into that in the future. My brain hurts thinking about it. This side, however, was pretty even and ready to go - it just needed some spackling and sanding. 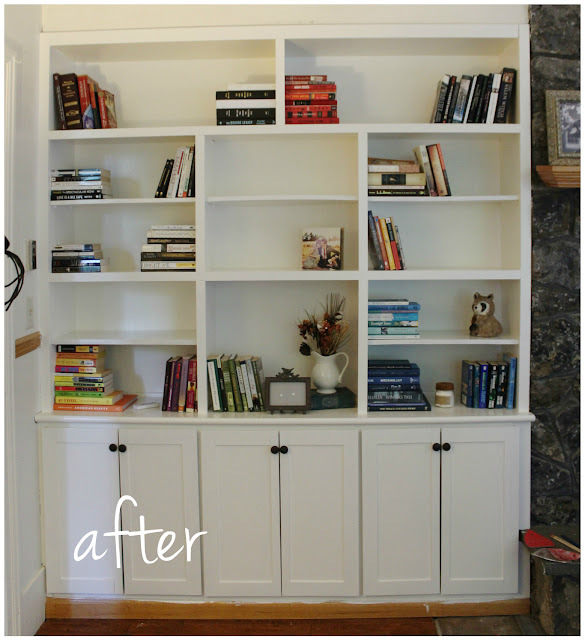 We used the Advance formula from Benjamin Moore (the same one we used for the kitchen cabinets) because I knew heavy things would sit on the shelves, and we needed a durable paint that wouldn't stick to our books. The color we picked is Bavarian Cream, also from Ben Moore, and it's the color we used for the trim in our entryway - we also plan to paint this room the same color as our entryway, but that's a whole other issue that may involve new drywall, sooooo, I'm not dealing with that right now. Even painted, they don't look quite as nice because they're up against a similar color, but I'm so excited to see them pop against the beige color once the walls are painted. Seriously, the cream color just looks so much more clean and bright and happy, amiright? When I started, I decided to spackle in the little shelving peg holes. I feel like when those are visible, they look more IKEA and less sophisticated, and that actually made a huge difference. Even though in the end, we decided to keep the pegs (which you'll see in a second), covering up the rest of the holes felt soooooo good. 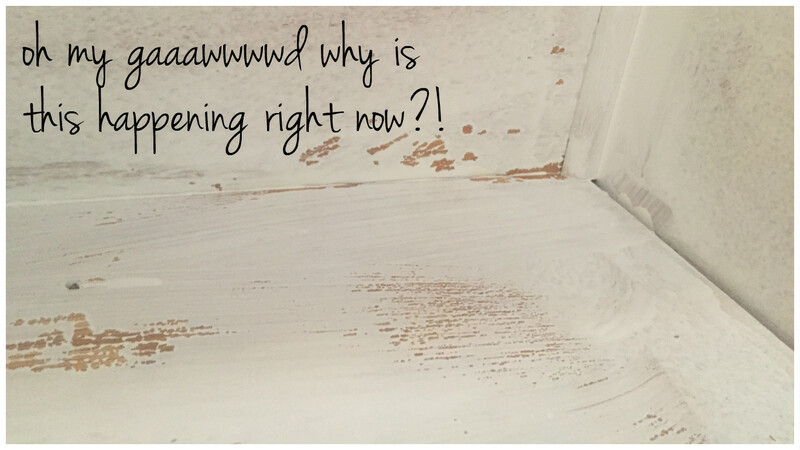 I also sanded down the entire surface before priming, and this is where I ran into a fail - I didn't sand enough. The wood had previously been treated with some sort of coating (what that coating is, though, I can't be sure). 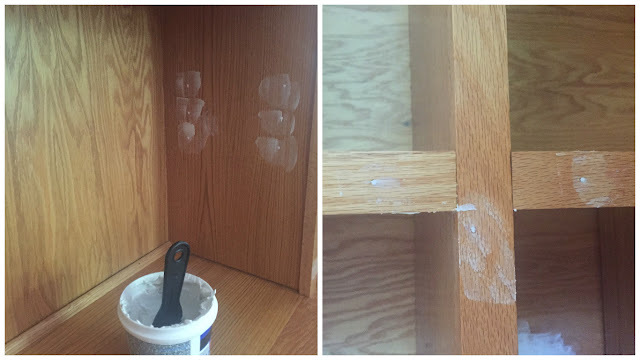 I didn't think about it too much when I started because we didn't have this problem with our kitchen cabinets, but when I started to apply the primer, it wouldn't stick in some areas, and it started to separate. After several moments of panic, I decided to try a second coat of primer, and that actually totally covered and evened out whatever was happening with the first layer. Phew! We needed two coats of paint, too, which was really frustrating, and even now, I can still see parts of the wood underneath poke through a little. Over time, I'll touch up any exposed areas that need it, but for now, I'm just happy to put stuff in there and call it a day. 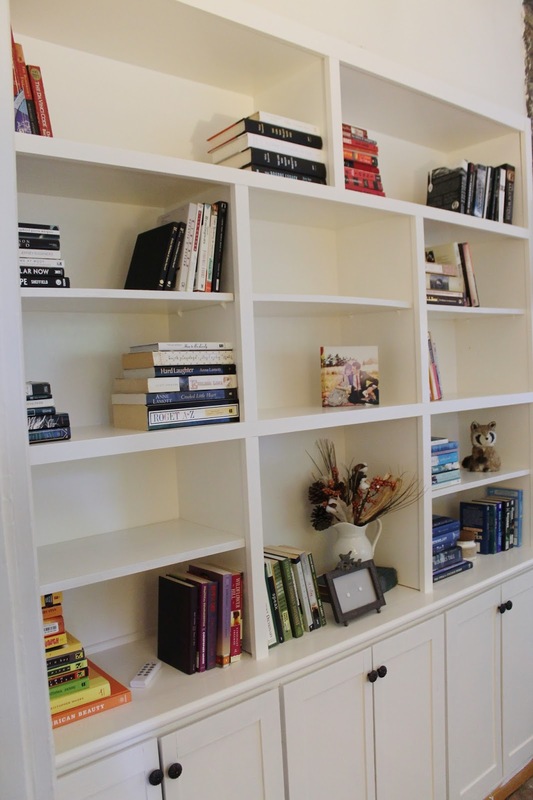 One of the most frustrating things about these bookcases is that whoever built them wasn't exactly the most skilled or detail-oriented. The doors on the bottom portion are horribly uneven. Josh was skilled enough to where we was able to fix them a little, but they still kind of gape in the middle, and not all of them are exactly the same size. Soooo, I had to take a deep breath and just decide to be okay with it. Which I am now. We also decided to add knobs to the doors to make it look a little more put together. I found these bronze leafy/floraly ones online, and I was so stinkin' excited because they totally went with our switch plates. I'm finding it's these stupid little details that get me the most excited. And finally, the only other thing we changed was removing a shelf in the bottom middle cabinet. I liked the idea of having one of the cubes more open to accommodate taller vases and frames. I still need to play around with it, but this is kind of where I'm heading with it for now. So while they're not organized exactly how I want them (we still need to unpack a few books and add some picture frames and knick-knacks), and the floor board trim underneath it isn't painted, at least they're functional now! And it's made such a huge difference in the space. Love it. But now I'm dreading working on the other side. Sigh. That's like a whole other thing. 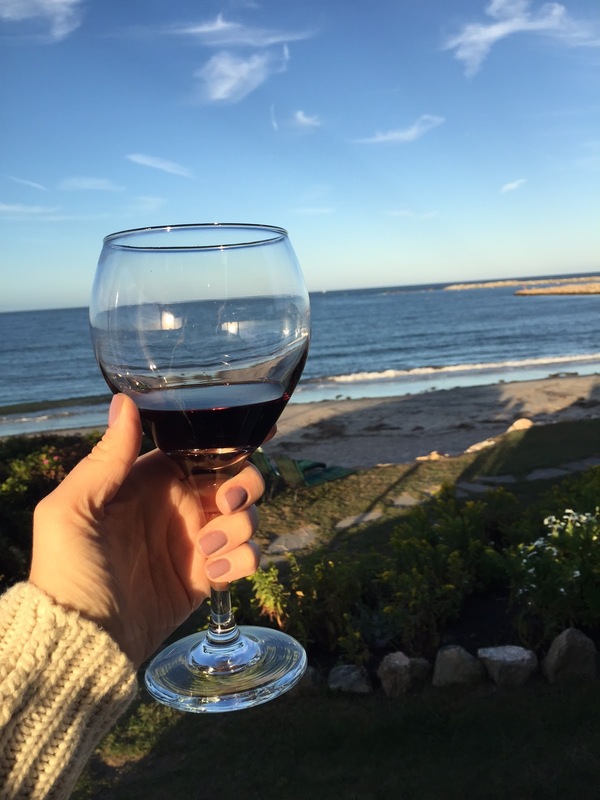 You can read Part 1 (Newport and Narragansett) here. I'm just going to start by saying ... 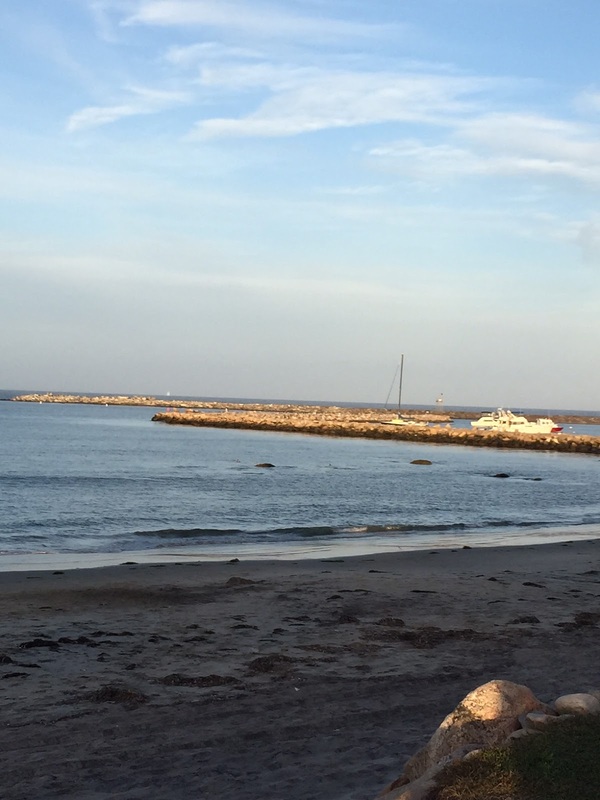 I LOVED BLOCK ISLAND. I loved it. I felt like I was somewhere so far from the rest of the world, but I was only four hours from home. 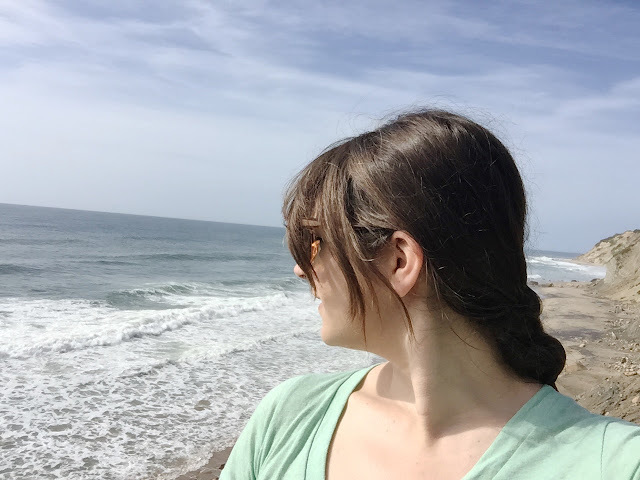 Block Island is definitely a summer destination (you know, being that it's ocean adjacent on all sides), and we definitely felt it when we stepped off the ferry. There were very few people around, and while it didn't feel completely deserted, it was just really quiet and somber. While the ferry does have an option to bring your car aboard, we opted to tackle the island by foot. So en foot, we were off to find our hotel. One of the things I loved about BI is that the ferry drops you off right in town, and most everything is centrally located there, including a lot of hotels. Our hotel was, at most, a 10 minute walk from the ferry. We stayed at the Avonlea hotel, and I'm not gonna lie, I kind of wanted to stay there because when I was younger, I was obsessed with Anne (with an E!) of Green Gables and the TV series Avonlea. 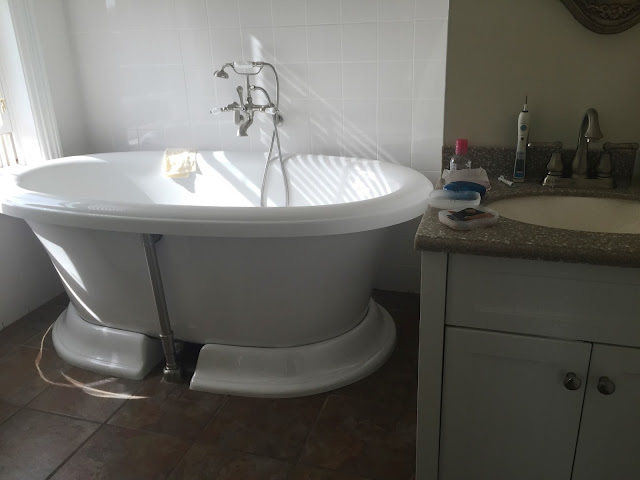 Aaaaaaand, I also have to be honest that the fact that the room we wanted had a freestanding pedestal tub was also something that sealed the deal for us. This hotel was amazing. It's hard to even put into words how much I loved it. 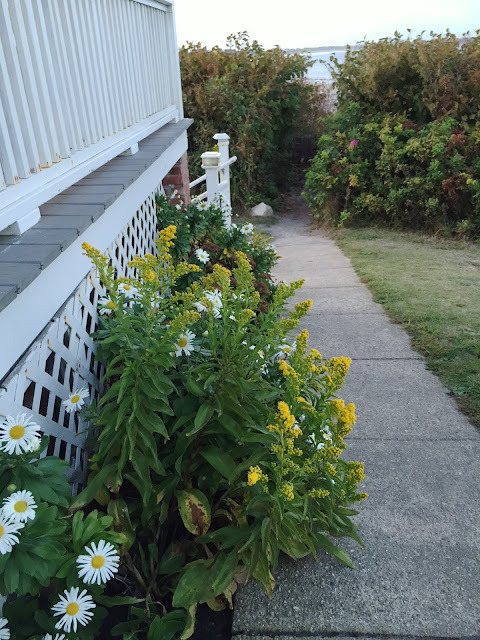 While it was located a short walk into town, it was also right on the ocean, and very quiet. Oddly quiet, actually. Not sure if it was because it was off season, but a party-type bar (Three Kittens) was right next door, and we never heard a peep from them later in the evenings even though we saw plenty of people out there, and heard the music playing as we walked by on our way back at night. It felt like we were miles from town, actually. 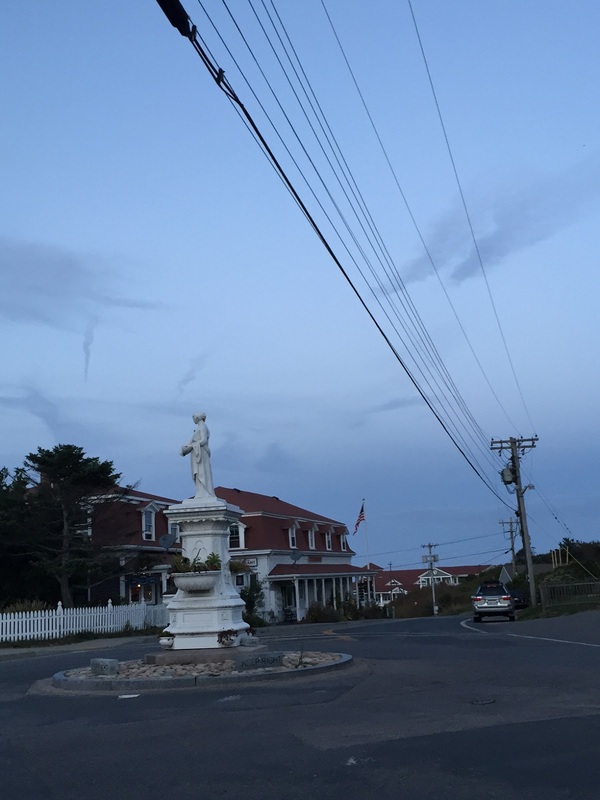 The hotel, or inn, I guess is more accurate, is affiliated with the Blue Dory. BUT, if you're planning a trip here, and are deciding between these two hotels, go with the Avonlea. The Blue Dory is right on the main street by the ferry drop-off. Especially during peak season, I can imagine it would be a little noisy, and the views aren't quite as nice. 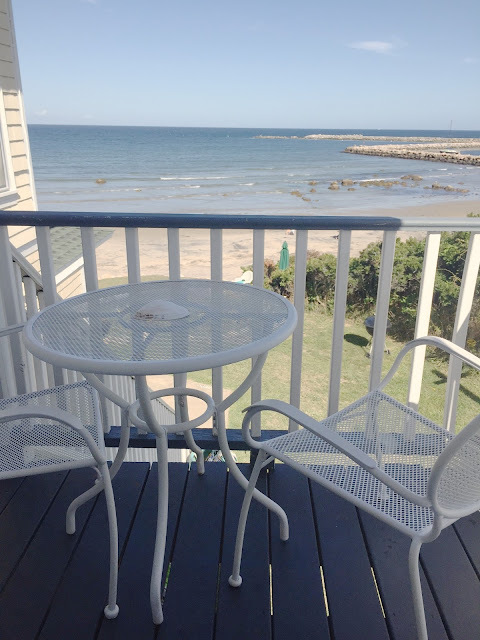 Plus, the Avonlea has a killer wrap-around victorian deck that's perfect for watching the waves at any point during the day. Our private balcony with perfect views of the ocean. The room was so airy with views from all the windows. We chose the Amethyst room at Avonlea, which was one of the more affordable rooms, but I don't understand why because I loved it. It's small. Like, when you walk in, you're face-to-face with the bed. BUT, this little room has the awesome bathroom with the tub (also a walk-in shower) and a private balcony with a stunning view of the ocean. It's also off a little corridor in the house, so it's a little more secluded. It was designed just right with clear glass panels in the door, and windows all around so when they were all open, you just saw the ocean. It was perfect. Our first day on the island, we just decided to get our bearings and walk around to see where everything was. We headed downtown to explore, and we stumbled upon a jetty. 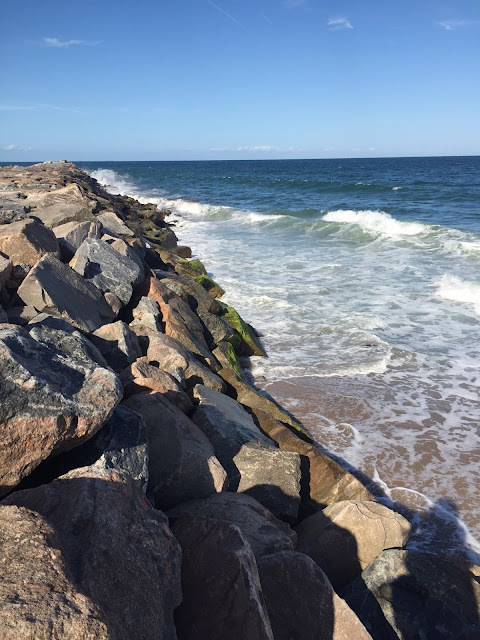 I'm a sucker for jetties, so we spent quite a bit of time walking on it as the sun was setting for the day. We also quickly realized while walking around that because we were there at the end of September, off season had officially kicked in, and most restaurants were closed for the season. Our dining options were limited, but that night, we ended up at a great little place downtown called Mohegan Cafe and Brewery. At night, we went back to our room, and left the windows open to fall asleep to the sound of waves. 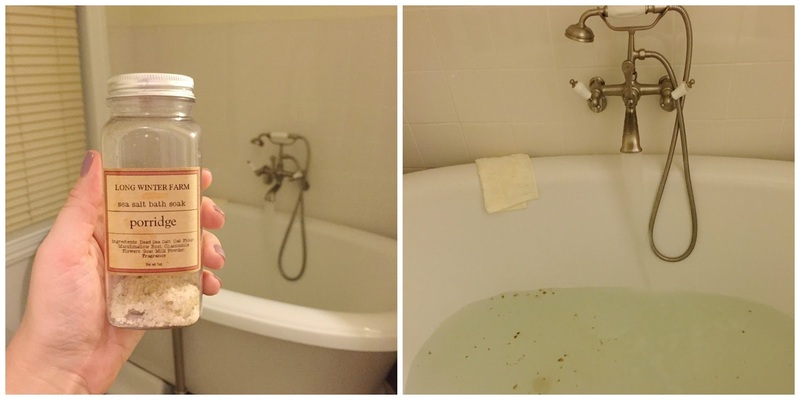 Oh, and I took a bath. Every night we were there. It was awesome. I need this bathtub in my life. It's actually the exact one I had picked out for our bathroom someday, so I got to test it out beforehand. I approve. The next morning (and every morning we were there), we enjoyed breakfast on the front porch of the hotel, which I loved. One thing I don't love about B&Bs is eating breakfast with other people (Oh hey, I'm Sam, this is my husband Josh and we have morning breath and haven't brushed our hair, but we changed out of our PJs for you, so you're welcome, and where are you guys from?). At Avonlea, there were plenty of individual tables with a buffet style breakfast, and it was lovely. No forced small talk with strangers. This makes me sound like a recluse, but I'm just not an early morning, full-on conversation person until after I've eaten. Food is like my coffee. Ask Josh. 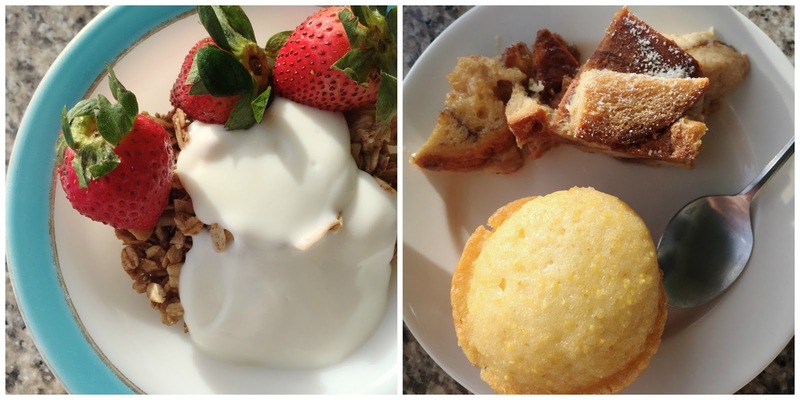 Typical breakfast. 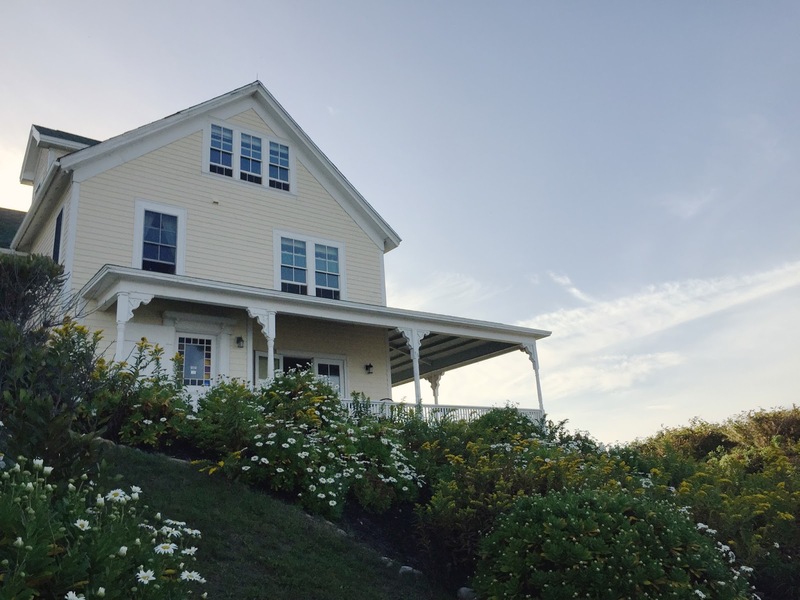 Our innkeeper is a trained chef that used to work the Newport, RI restaurant scene. 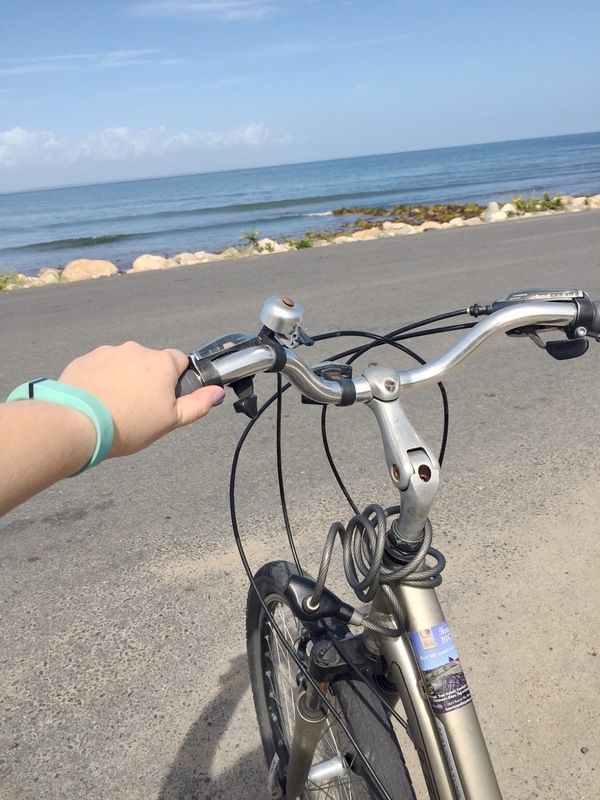 Later that morning, we rented bikes to explore the island. Josh is an avid biker (of the bicycle variety, not the Harley variety), but I'm a little less experienced. Thankfully, I picked it up pretty quickly, and we were off to explore Mohegan Bluffs. Although, Josh had to look over his shoulder like every five seconds to make sure I wasn't passed out on the side on the road (I prefer going downhill, apparently, not so much uphill. I struggled). The Bluffs were incredible. I could have stayed there all day with a picnic. The view from the top and bottom of the stairs were both insane. 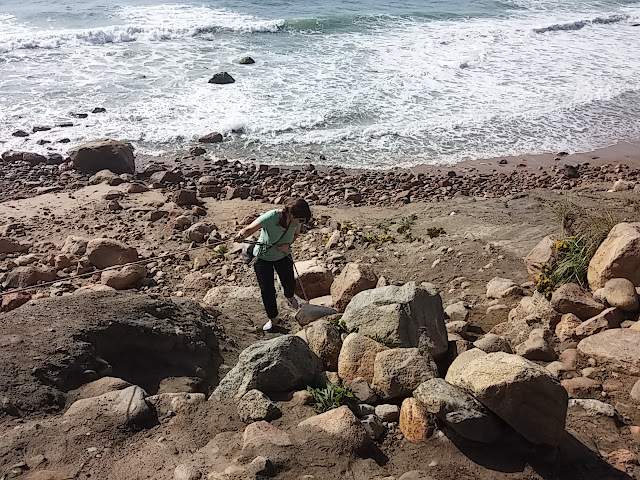 Once you get to the bottom of the stairs, you have the option of going down to the rocks to get closer to the water for even better views. It's steep and slippery, but there's a rope there to help you get down. Josh was iffy, and I just decided to go for it. I believe my exact words were "eff it, I'm just doin' this." It was worth it. After the bluffs, we biked all the way up the island, making a pit stop at The Oar restaurant. 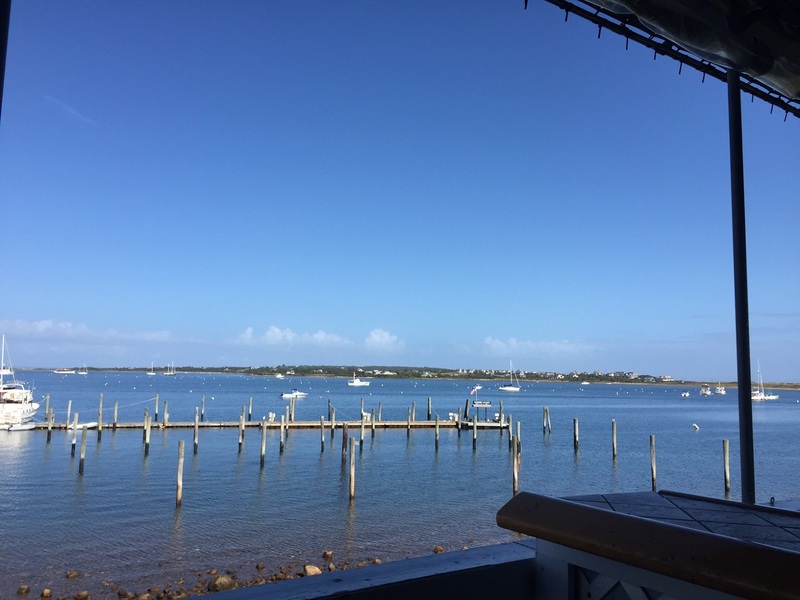 A while back when we booked this trip, quite a few people said this was a great lunch spot. 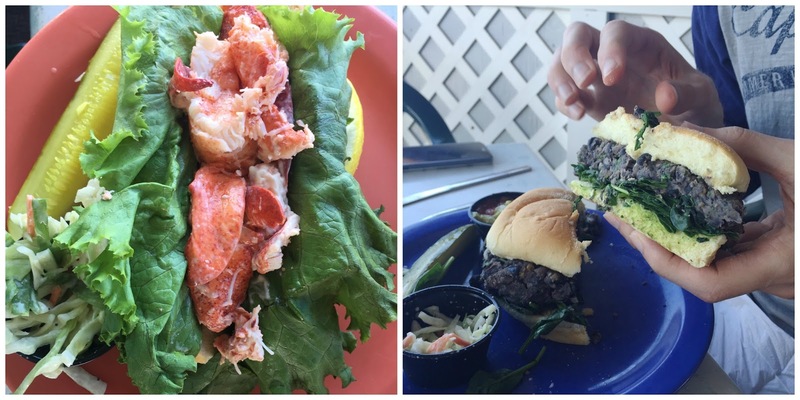 I was ready for a lobster roll, and Josh was able to get a veggie burger as big as his head. Plus, the view wasn't too bad. Then we got back on our bikes and headed to the very top of the island near the wildlife sanctuary and the lighthouse. And finally, after that, we made our way to Clayhead Trail for a short hike. Since we were kind of on a time crunch with the bike rental, we couldn't stay long, and that's one thing I regret is not having enough time to explore the trail. I've heard it's more amazing the further you go. During the hike, it spit us out at a beach, and I couldn't believe how gorgeous it was. 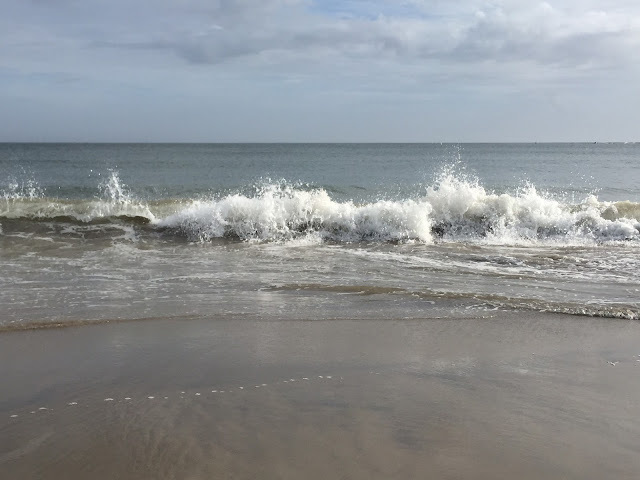 If there weren't teenage boys there, I was ready to strip down to my underwear and jump in the waves (they were huge that day and it was hot outside). But, you know, I'm a lady and stuff so I kept my clothes on, and went on with our hike. Next time, though, I'll be more prepared for an impromptu swim. That day, we biked 15 miles and my FitBit recorded 18,000 steps (we had to walk to and from the bike rental place, plus hiking). I was pooped. We got back to our hotel, and we decided to just relax. The day before, we saw that it was calling for rain the last day and a half of our trip, and with not much else to do on the island, we stopped at the local book store and bought books in case we were stuck inside. Even though the weather was still gorgeous, we both wanted to take advantage of the views from the hotel, and we just sat outside and read books in the chaise lounges. Side note: I loved this book, The Husband's Secret. I thought it was just going to be a quick, easy light read, and while it was kind of all those things, I was surprised at the complexity of the human experience in this one. It caught me off guard. Not the best book I've ever read, but I liked it a lot more than I thought I would. When I got home, I ordered another one by the same author. Yay! 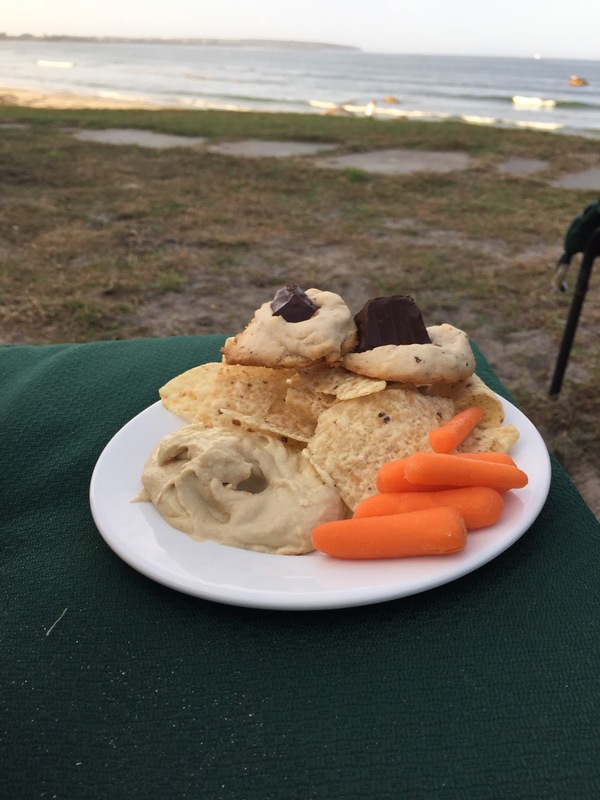 Our hotel also had cocktail hour every night, and they provided light snacks, wine and their famous cookies, the Block Island Barnacles. We totally were down there right when it started every night. We were those people. Hey, it's that couple in the Amethyst room eating all the cookies again! I'm not sure why, but being at this hotel made me feel like I was on Prince Edward Island or something. 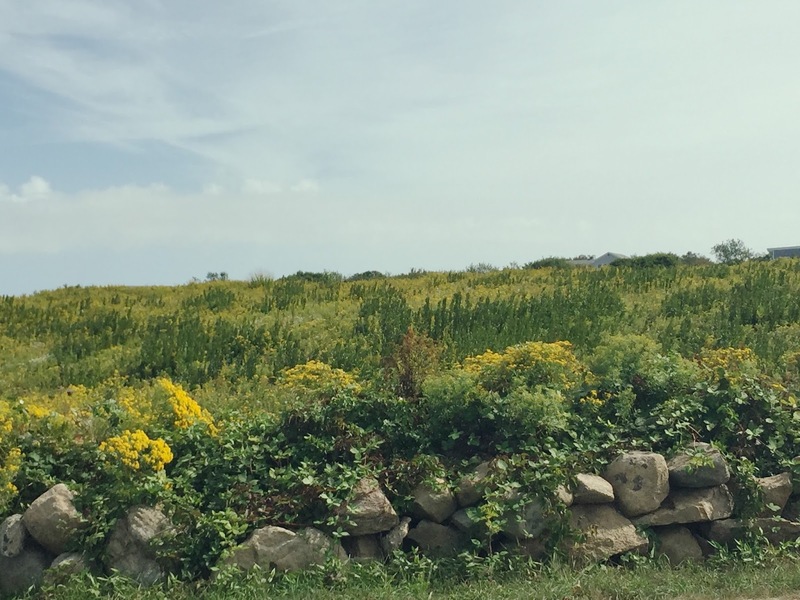 I didn't feel like I was in Rhode Island, and it was rather surreal. I couldn't get over the fact that everywhere I went in the hotel, I could listen to the sound of the waves. For dinner that night, our options were limited because it was a Monday, and some restaurants that were still open for the season were closed on Mondays. So, we ended up at the Poor People's Pub, which was about a quarter mile from our hotel. Really great pub food, and we were able to sit outside on the deck. On our last full day, we didn't have much planned. We decided to visit some of the local shops, but I will say, BI is not a shopping destination, but I didn't expect it to be, either. 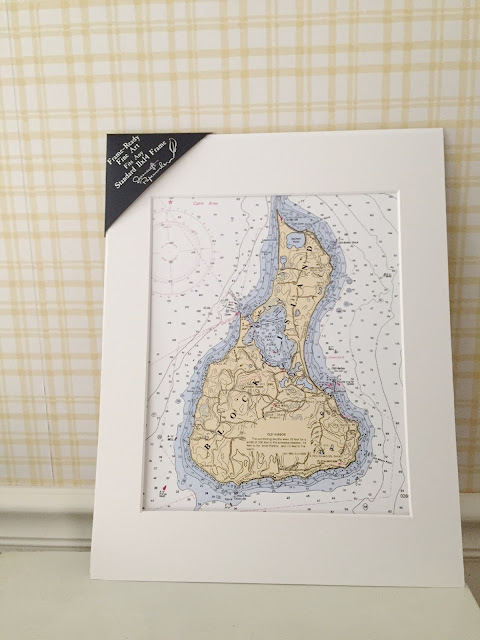 We popped into a few places, and I'm usually the kind of person that will buy like ten things on vacation, but we left with one little print of a BI map to hang on our wall at home. And that was pretty much it. There were some nice little boutiques, but nothing spectacular. We walked back to The Oar for lunch (partially because of limited options, partially because we just really liked it). Oh darn, we have to eat delicious food and look at the water again. It was threatening rain on and off all later in the day, so we just decided to go back to our hotel to read and relax the rest of the afternoon (you know, until cocktail hour time). 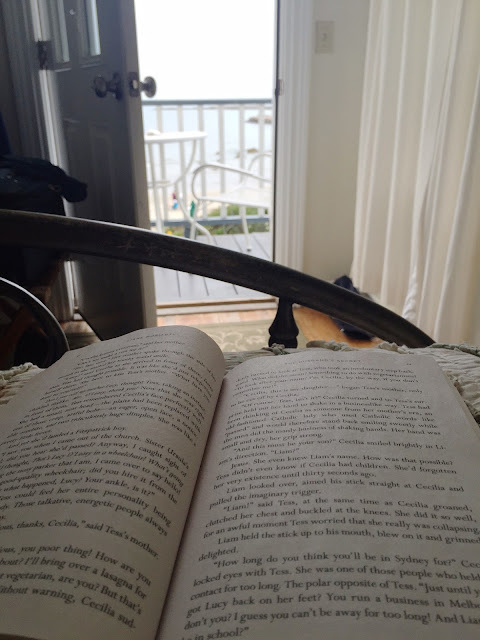 It sprinkled on and off, but it wasn't so bad that we had to close our windows and door, so we left them open to hear the ocean, and just read, took a nap and relaxed. Usually on vacation, we're all about being busy exploring and being out and about, which is relaxing to us in a way, too. But this time around, it felt so good to just sit and do absolutely nothing. 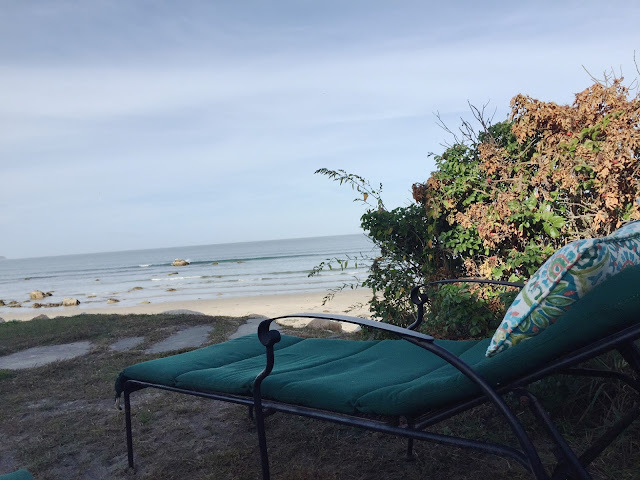 Especially with working full-time, and renovating a house, we never really have down time anymore, so this was the perfect excuse and the perfect place to do it. 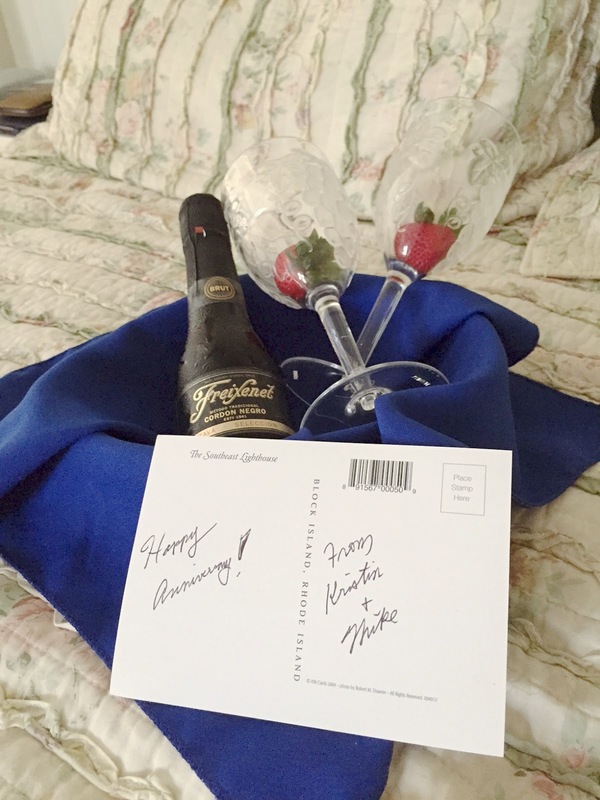 When we got back to our room, we found this waiting for us, so some champagne consumption may have taken place. Happy Anniversary two days ago to us! For our last dinner, we went to a Mexican restaurant called Calaveras, and we were literally the only ones there. On our walk there, it felt like the island was, in fact, deserted. It was weird and kind of awesome and like 1% awkward. Is anyone out there? No? Okay. But, it was really cool to be the only customers at the restaurant. We got to pick any table we wanted, the service was impeccable, obviously, and the food was to die for. 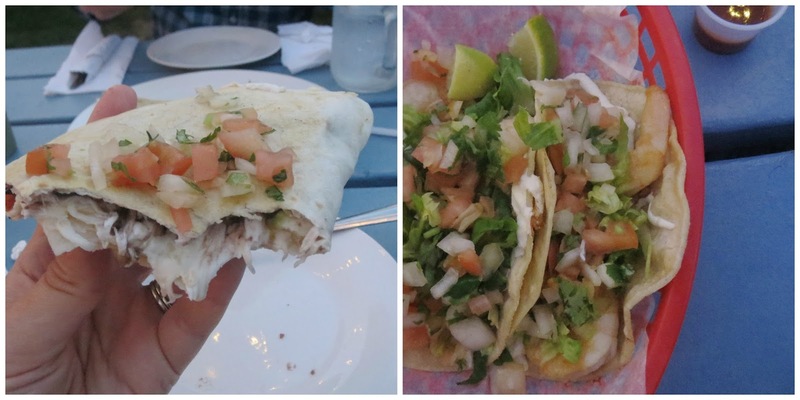 We shared the veggie quesadillas, and I got the shrimp tacos, and I was one happy lady when we left. The next day, we had to say goodbye. And it down poured. It was raining so hard that we were soaked all the way through our clothes when we got to the ferry. AND, our ferry was cancelled. Thankfully, the next one was running, but I was kind of hoping, actually, we'd get stuck there for another night. I was already planning out what I would have during cocktail hour at the hotel when they said the next ferry was coming. I was sad. BUT, we had an incredible vacation. And now we're rested and recharged for more house projects! Overall Verdict: I'm smitten with Block Island, and while I can understand the appeal for a summer vacation there, I think I, personally, would prefer it during off season. The hotel we stayed at had amazing off season rates (it was over $300 a night during peak summer season for our room) and we got it for about half that, plus a free night for a mid-week, off season special). So, it was relatively inexpensive for what you get (a great view, complimentary breakfast and cocktail hour). The island is small, and if this is a popular destination in the summer, I feel that personally, I could see myself getting overwhelmed by the crowds. Especially because the hotels and restaurants are clumped together in two main towns, and that's it. The rest of the island is either residential or nature-y. 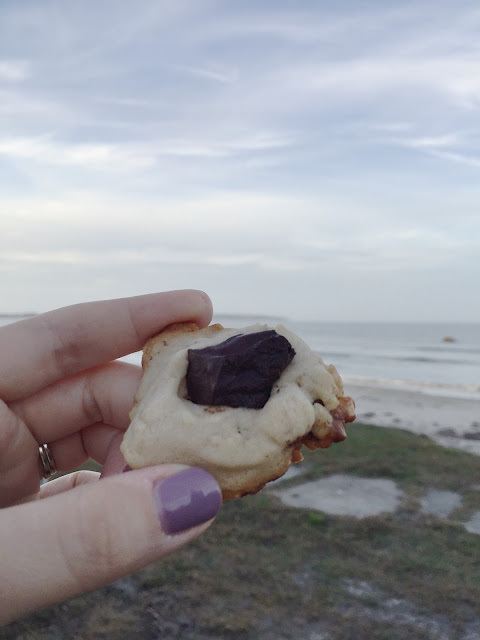 I loved the secluded feeling during off season, and while I was disappointed at first that many of the restaurants I had wanted to try were already closed, the few that were open were excellent, and it didn't really matter in the end because we weren't there for the dining experiences. BI is great for exploring and being active, and also, perfect for relaxing and resting your body and brain. It's the best of both worlds. And, if you're an Anne of Green Gables fan, I get the feeling you'll kind of feel like you're in that world a bit. So, that's a bonus.